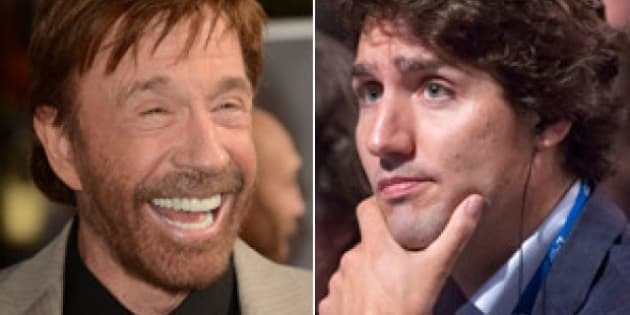 Just imagine: It's April 2013 and the Liberal Party has gathered in Ottawa to hear that their new leader is... Chuck Norris. While that outcome may seem far-fetched, if the Liberals follow through with their plan to combine a new category of party membership with online voting, they may end up with an outcome just as ridiculous. The new "supporter" category was created at the Liberal Convention in January and is aimed at widening the base of participants for the leadership vote, making it more like a U.S.-style primary. Anyone interested in the party can sign up online and 30,000 people have already done so. If everything goes as planned, these supporters will vote for a new leader in exactly the same way as a full party member: in person or by mail, phone or internet. It's the internet bit that's interesting because, judging from the history of web, online votes have a tendency to go hilariously wrong. Just take the example of the Chuck Norris bridges. Earlier this year, a regional authority in Slovakia launch an effort to name a new pedestrian and cycling bridge to Austria via an online survey. The result was an avalanche of votes for the "Chuck Norris bridge," in reference to the American action star. This prompted the assembly to go back on their original promise to honour the wishes of citizens and name it something else. The Slovakian effort was itself inspired by an earlier bridge vote-rigging effort in Hungary partly engineered by American satirist Stephen Colbert. The bridge in question connects the two sides of the Hungarian capital of Budapest and was also to be named via an online vote. Chuck Norris jumped to an early lead, but then Colbert instructed viewers to vote for him instead and to use whatever nefarious means necessary to achieve victory. The result? Colbert won with roughly 10 million more votes than the entire population of the country. A second vote was organized, this time requiring registration, but Colbert won again. Authorities ignored the outcome and named the bridge something else. While these stories may seem ridiculous, there is a very real possibility that similar tomfoolery could plague the Liberal vote. The party has yet to figure out all the details, but supporters will have to sign up and provide registration details, such as an address, that will supposedly allow the party to verify an individual's identity and whether he or she already belongs to another political party. The Liberals have until March 17 to figure it all out. But some in the party have already expressed fears the vote could be open to manipulation. MP Joyce Murray, a likely leadership contestant, has suggested the Conservative party might sign up supporters in an effort to influence the vote, referencing allegations the Tories were involved in misdirecting voters to non-existent polling stations during the last election. She has suggested a fee might deter such a campaign, a measure which has been rejected by the party leadership. It's not just the Conservatives the Liberals should be worried about. It's easy to imagine users on the website reddit or hackers from Anonymous banding together in a campaign to make one of the more obscure candidates party leader. The Liberals have already taken one measure to stop just such an effort, imposing a deadline of roughly six weeks before the final vote for supporters to sign up. Theoretically, this will prevent webizens with ignoble intentions from registering just as the campaign gets really interesting. Of course, in reality, debates will start in January and there is already plenty of buzz around the race (anyone heard of Justin Trudeau?). An ill-intentioned online campaign to influence the vote could be in the works already. And such a campaign may be the least of the Liberal's worries. If the cyber attack that marred the vote at the NDP convention in March is any indication, conducting a leadership vote online, especially when the details are left until late in the game, is a dangerous proposition. But success is possible. In 2000, Arizona Democrats conducted a presidential primary using an online vote. Despite lawsuits, security threats and problems with certain browsers, voter turnout increased 500 per cent from the previous primary and the election was hailed as a victory for democracy. If the Liberals want to replicate the success in Arizona, they will need to move swiftly on the rules for verifying identities and the electronic infrastructure needed to support a secure vote. Even then, it seems the race could still be subject to a major pwning.